Opening Day March 23rd 2019! 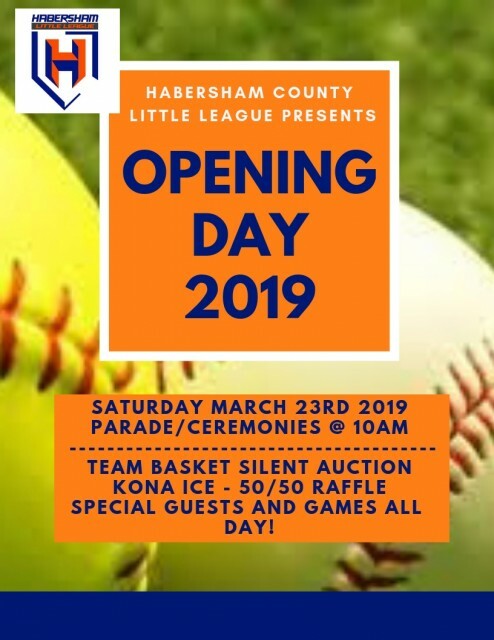 Updated Wednesday March 13, 2019 by Habersham Little League. OPENING DAY IS UPON US! PARENTS AND COACHES PLEASE HAVE YOUR PLAYER(S) AT THE FIELDS NO LATER THAN 9:30AM ON THE 23RD. YOU WILL DROP YOUR PLAYERS OFF AT THE SOFTBALL FIELD FOR PARADE LINEUP AND YOU AND YOUR FAMILIES CAN GET A GREAT SEAT AT FIELD 2 FOR THE CEREMONIES. TEAMS YOU ARE WELCOME TO CREATE POSTERS OR BANNERS TO WALK WITH DURING THE PARADE AND SHOW OFF SOME MORE OF YOUR HCLL PRIDE! TEAM BASKETS NEED TO BE TURNED IN WHEN YOU ARRIVE SO WE CAN GET THE SILENT AUCTION STARTED RIGHT AFTER CEREMONIES! WE CAN'T WAIT TO SEE WHAT YOU'VE GOT AND ANNOUNCE ALL OUR WINNERS!! THE WINNER OF THE GRAND PRIZE WILL BE POSTED LIVE ON FACEBOOK AFTER THE LAST GAME OF THE DAY WHEN WE CLOSE OUT THE SILENT AUCTION! THANKS TO CRYSTAL CAUDELL WE WILL ALSO BE HOLDING A 50/50 RAFFLE FOR EVERYONE TO GET IN ON THAT DAY PLUS WE WILL HAVE SPECIAL GUESTS WALKING AROUND AND KONA ICE! COME ON OUT CAUSE IT'S GOING TO BE A GREAT DAY!